Download "White Paper September 2009. 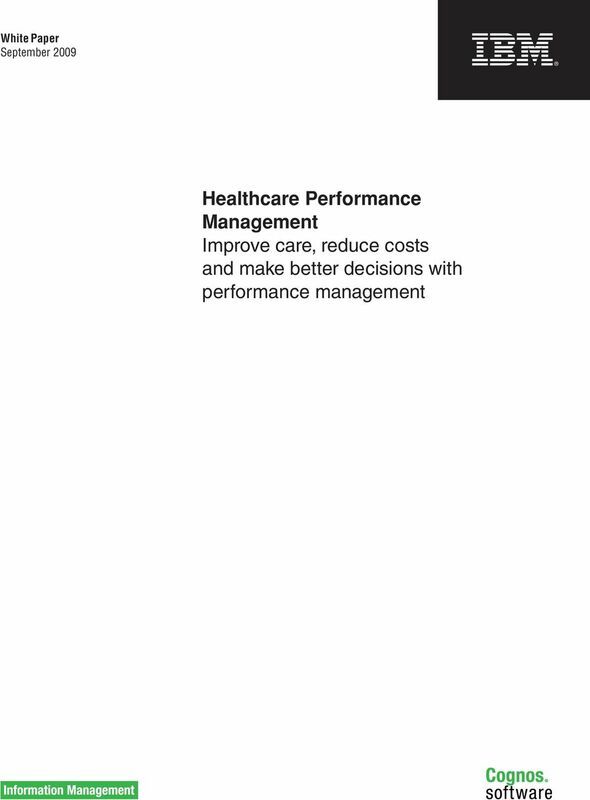 Healthcare Performance Management Improve care, reduce costs and make better decisions with performance management"
3 3 useful, relevant information. With business intelligence (BI) and performance management capabilities you can understand what s behind critical issues, trends and opportunities. You can gain an accurate, forward-looking view of operational performance and can plan accordingly while promoting collaboration. With healthcare performance management, your organization gains a complete and consistent view of all key profitability drivers so you can: Track and monitor expenses and reimbursements, margins and operational performance. Analyze results and identify trends. Model the impact of business decisions and improve financial processes. Monitor quality initiatives and care programs. Support pay for performance goals and initiatives. Gain an enterprise-wide view of performance against organizational goals, key performance indicators (KPIs) and strategic objectives. Quickly adjust plans to achieve profitable growth. 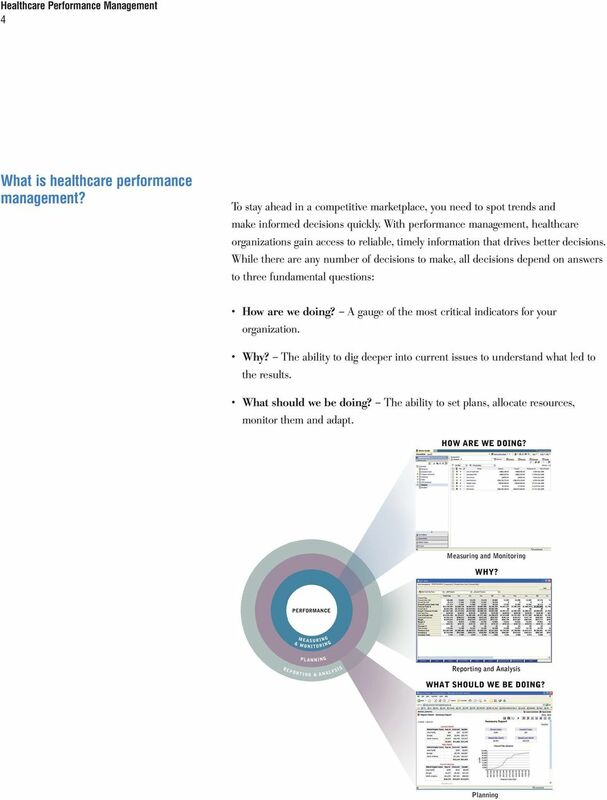 Organizations across the healthcare continuum rely on IBM Cognos performance management and BI software solutions to identify and leverage core competencies, exploit competitive positions, promote productivity and constantly improve, measure and monitor quality. 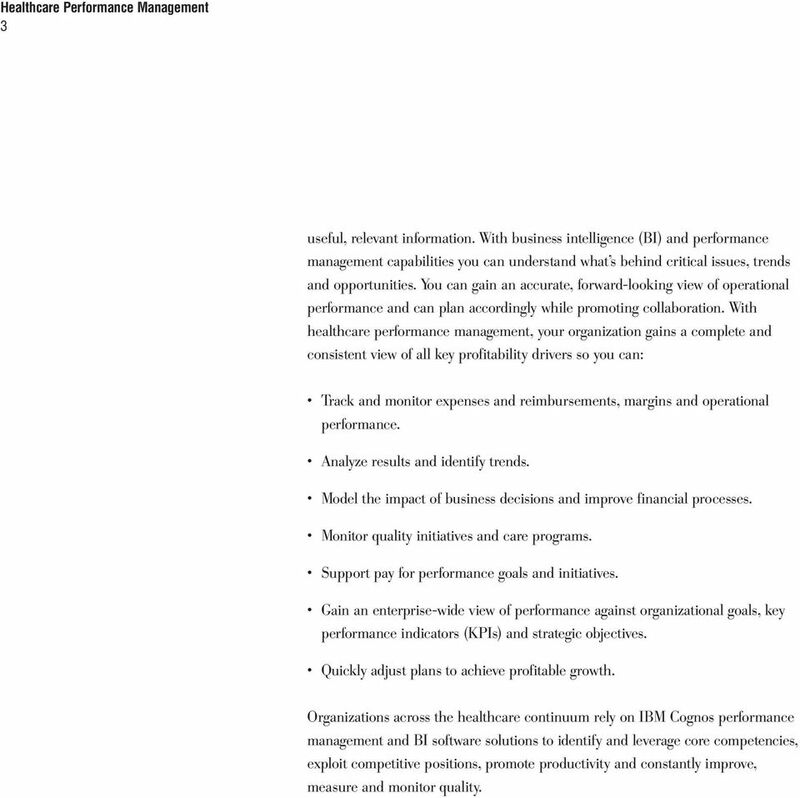 4 4 What is healthcare performance management? To stay ahead in a competitive marketplace, you need to spot trends and make informed decisions quickly. With performance management, healthcare organizations gain access to reliable, timely information that drives better decisions. While there are any number of decisions to make, all decisions depend on answers to three fundamental questions: How are we doing? A gauge of the most critical indicators for your organization. Why? The ability to dig deeper into current issues to understand what led to the results. What should we be doing? The ability to set plans, allocate resources, monitor them and adapt. 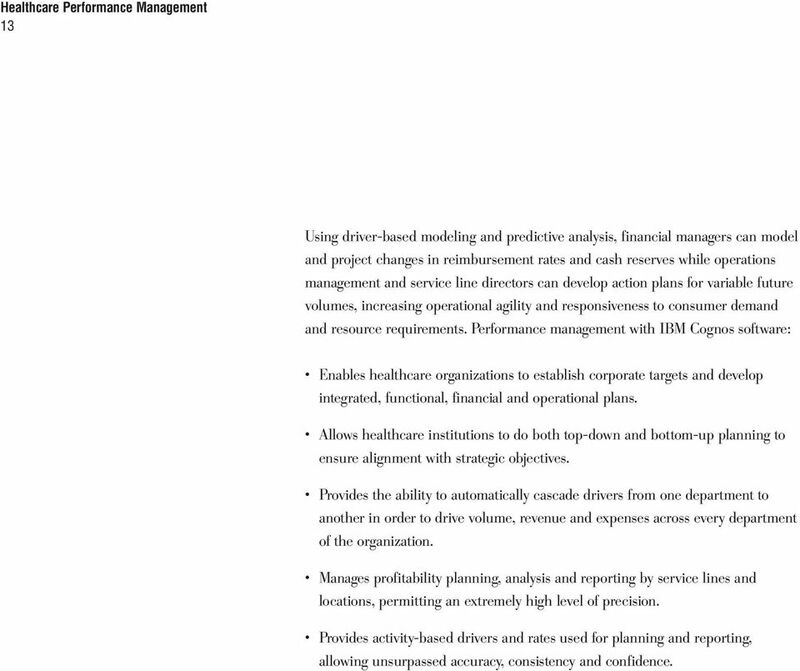 5 5 IBM Cognos software provides a performance management framework that allows healthcare organizations to measure and monitor performance, plan for the future and provide service-line directors and financial administrators with reporting and analysis that enhances clinical care processes and business operations. It provides a single, enterprise platform for healthcare performance management. IBM Cognos software integrates and leverages your myriad of data sources and allows your organization to employ the following capabilities to answer these three critical business questions: Measuring and monitoring IBM Cognos software communicates your strategy and objectives through metricsbased scorecards and dashboards. It answers How are we doing? by providing service-line directors and staff with the information they need to take ownership of their performance by providing visibility into strategy, enabling an understanding of the part they play in making the strategy succeed and presenting the metrics to measure their success. By enabling the strategic alignment of objectives against performance metrics, you can answer at any time the key question: Are we making progress on the things that must be done? 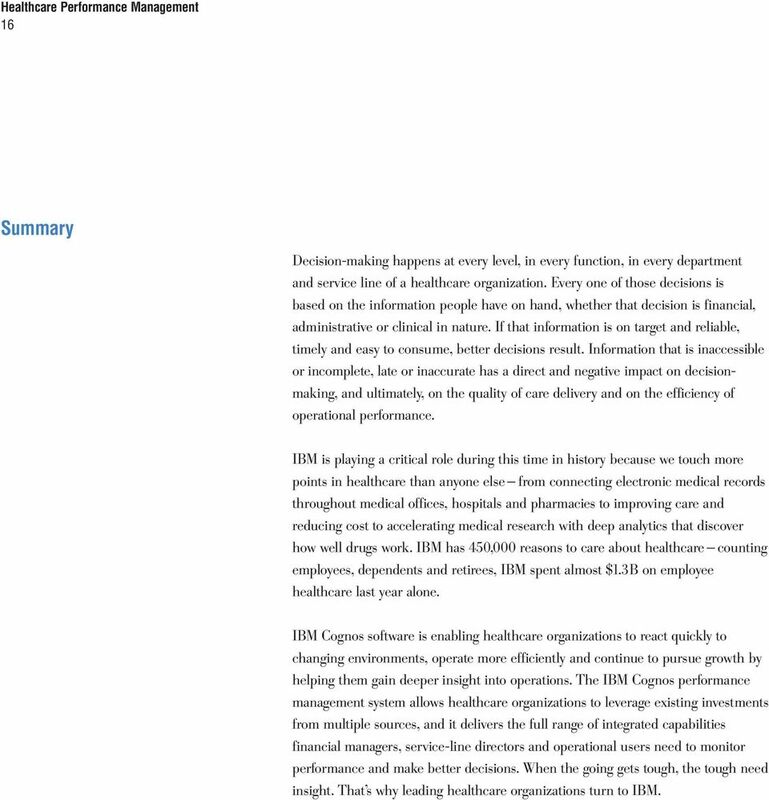 Healthcare organizations utilize IBM Cognos scorecarding and dashboards to: Monitor revenues and margin performance by service line, by department, by facility and at the enterprise level. Measure performance against strategic institutional initiatives. Monitor quality across multiple locations and service lines. Track financial goals in terms of growth, profitability, key controllable expenses and return on net assets. Aggregate profitability and operational data from multiple silos across the organization to deliver dashboards and scorecards to care providers and management. 6 6 Like any other strategic initiative, performance management initiatives and utilization of dashboards and scorecards are most successful when coupled with the strategic vision and endorsement from the organization s executive team. IBM Cognos solutions support the development of a collaborative environment, promote accountability through aligned performance metrics and enable healthcare organizations to make better decisions about their business: from operations and quality, to service line management, resource planning, capital expenditure planning and strategic initiatives. Reporting and analysis Consolidating the large data volumes your organization amasses is a huge challenge. It is especially difficult given that there are also many tools used to analyze and report on the data, creating more islands of information. IBM Cognos reporting and analysis consolidates your critical data and turns it into meaningful information and reports that everyone can use. You can quickly spot trends and drill down to discover underlying causes and issues. The flexible, userfriendly reporting means everyone has the right information delivered in the right way across all departments, service lines, locations, functions and roles. 7 7 With a single, standardized BI platform for reporting and analysis, you can accurately assess the Why? behind operational activity and performance. This provides the necessary context against which decisions can be made. 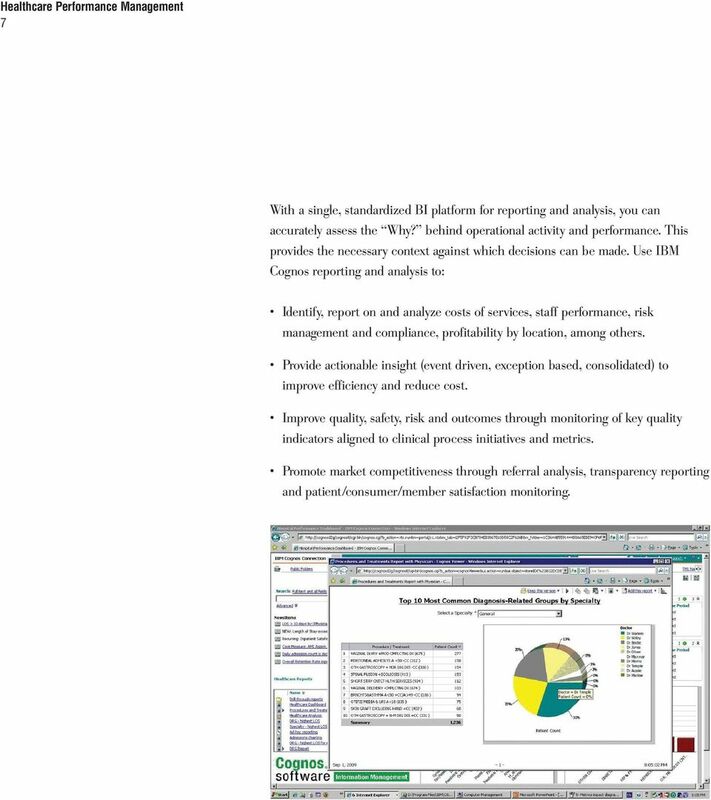 Use IBM Cognos reporting and analysis to: Identify, report on and analyze costs of services, staff performance, risk management and compliance, profitability by location, among others. Provide actionable insight (event driven, exception based, consolidated) to improve efficiency and reduce cost. Improve quality, safety, risk and outcomes through monitoring of key quality indicators aligned to clinical process initiatives and metrics. Promote market competitiveness through referral analysis, transparency reporting and patient/consumer/member satisfaction monitoring. 8 8 Budgeting and planning Many healthcare organizations still use spreadsheets as their primary vehicle for planning and budgeting. Spreadsheet-based systems create islands of financial and planning data, where everyone works independently. What s required instead is a solution that replaces a fragmented process with continuous, collaborative planning that supports improved quality of care and delivers up-to-date insight into operational performance. 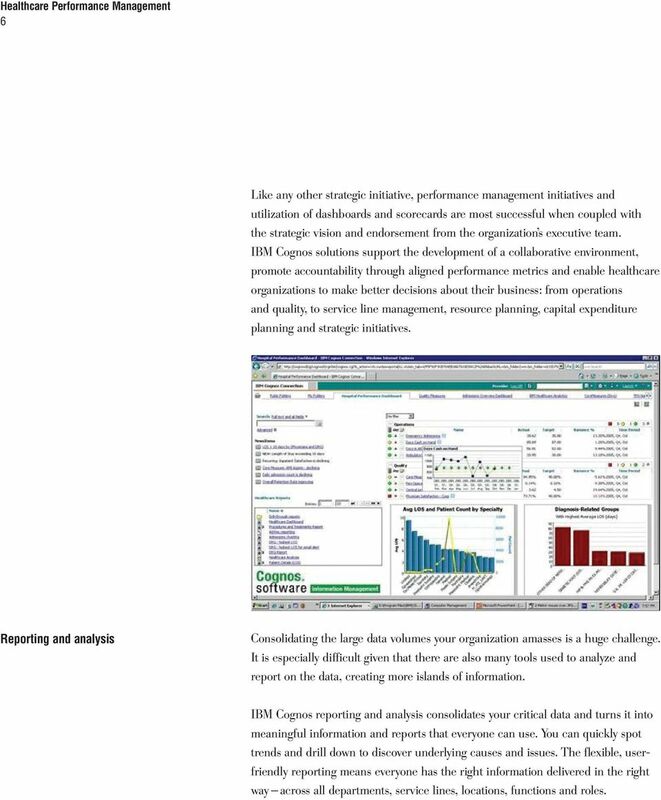 IBM Cognos software helps you build a foundation for higher performance by connecting strategy to plans, expense targets, revenue objectives and operational objectives. 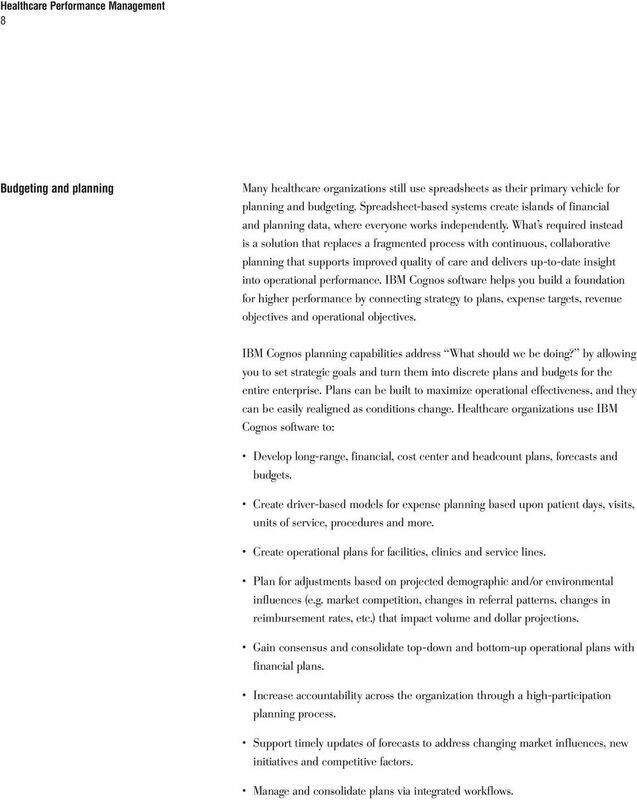 IBM Cognos planning capabilities address What should we be doing? by allowing you to set strategic goals and turn them into discrete plans and budgets for the entire enterprise. Plans can be built to maximize operational effectiveness, and they can be easily realigned as conditions change. Healthcare organizations use IBM Cognos software to: Develop long-range, financial, cost center and headcount plans, forecasts and budgets. Create driver-based models for expense planning based upon patient days, visits, units of service, procedures and more. Create operational plans for facilities, clinics and service lines. Plan for adjustments based on projected demographic and/or environmental influences (e.g. market competition, changes in referral patterns, changes in reimbursement rates, etc.) that impact volume and dollar projections. Gain consensus and consolidate top-down and bottom-up operational plans with financial plans. Increase accountability across the organization through a high-participation planning process. Support timely updates of forecasts to address changing market influences, new initiatives and competitive factors. Manage and consolidate plans via integrated workflows. 9 9 With integrated plans, BI reporting and analysis, and performance metrics, you can dramatically improve your understanding of the organization. And this improves your ability to make timely and informed decisions that improve operations, increase margins and drive profitable growth. 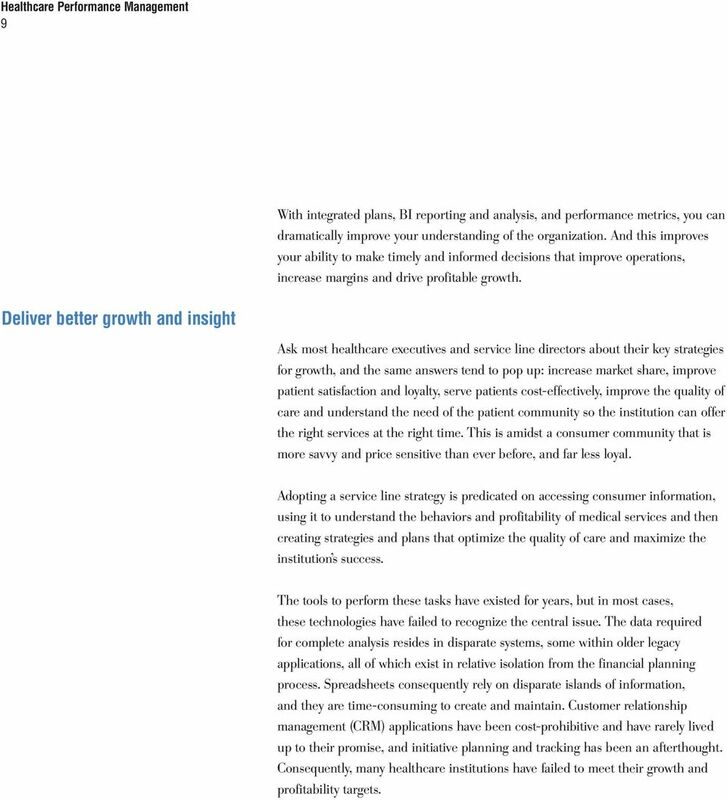 Deliver better growth and insight Ask most healthcare executives and service line directors about their key strategies for growth, and the same answers tend to pop up: increase market share, improve patient satisfaction and loyalty, serve patients cost-effectively, improve the quality of care and understand the need of the patient community so the institution can offer the right services at the right time. This is amidst a consumer community that is more savvy and price sensitive than ever before, and far less loyal. Adopting a service line strategy is predicated on accessing consumer information, using it to understand the behaviors and profitability of medical services and then creating strategies and plans that optimize the quality of care and maximize the institution s success. The tools to perform these tasks have existed for years, but in most cases, these technologies have failed to recognize the central issue. The data required for complete analysis resides in disparate systems, some within older legacy applications, all of which exist in relative isolation from the financial planning process. Spreadsheets consequently rely on disparate islands of information, and they are time-consuming to create and maintain. Customer relationship management (CRM) applications have been cost-prohibitive and have rarely lived up to their promise, and initiative planning and tracking has been an afterthought. Consequently, many healthcare institutions have failed to meet their growth and profitability targets. 10 10 With IBM Cognos software, healthcare institutions can aggregate referral data, better understand market segments and set and monitor specific targets that improve profitability: Service line and departmental reporting, analysis, dashboards and scorecards let service-line directors and operational staff see at a glance how individual clinics, ambulatory centers, departments and/or service lines are performing. Marketing departments can identify service areas to target to more efficiently serve the community and enhance operational performance. Initiative planning lets you perform what-if analysis and plan marketing initiatives by service, by specialty, by market or by practice. Service line P&L calculation and forecasting can be created dynamically from revenue, balance sheet and cost information to provide profitability insights. With IBM Cognos software, healthcare organizations can tap into vast amounts of utilization data and create real intelligence on consumer behavior, revenue streams and profitability by service lines or patient care facilities. They can also empower internal analysts to report on and analyze profitability by service area and patient demographics. Healthcare enterprises can more effectively plan outreach and marketing initiatives and monitor their success to feed information gained back into the process, creating a closed-loop cycle for continual performance improvement. 11 11 Increase operational efficiency Despite the tendency to retrench in times of economic turmoil, healthcare organizations cannot afford to stand still and wait for the storm clouds to pass them by. Analysts have time and again stated that the institutions that will survive the current economic crisis are the disruptors the ones who treat information as a strategic asset and know how to use it effectively. These disruptors will unite data, share information widely and analyze it rigorously to find new competitive advantage and squeeze out new efficiencies from the organization. 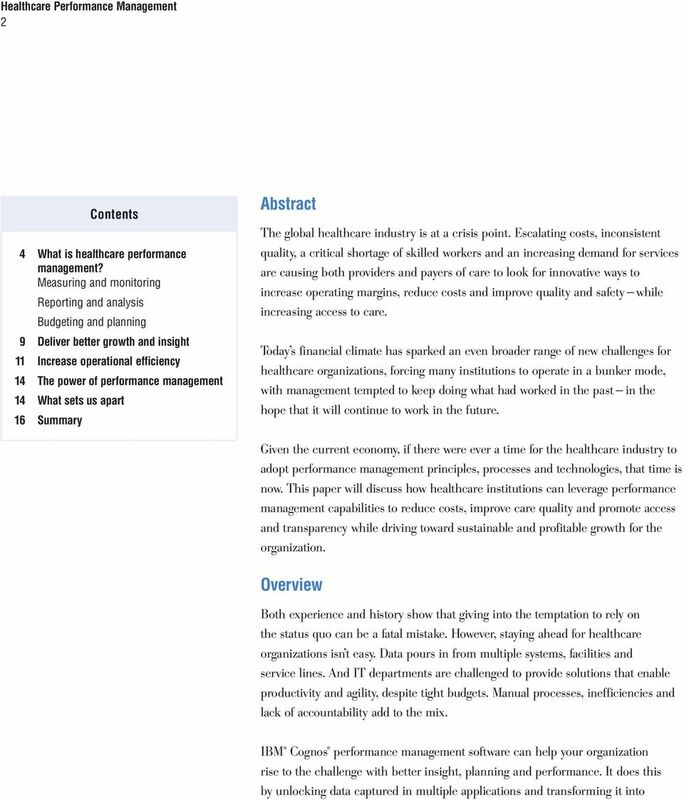 Healthcare providers must respond to economic challenges by shoring up internal operations to ensure that the entire organization is running at peak efficiency. Making this determination, however, requires an in-depth understanding of how well the organization is operating relative to its historical trends, its peers and the overall market. To gain this insight, your institution needs the ability to connect operational details to business drivers. Scorecarding for example, is a great application for finding new efficiencies. With scorecards, healthcare organizations can distil information into a small number of metrics and targets to: Deliver at-a-glance information Stop sifting through a stack of reports to find what s right or wrong. Scorecards show you immediately how the organization performs against targets you set. Communicate strategy and targets Metrics show everyone what s important, what s expected and how you re doing. Increase accountability Let care providers and operations personnel see the strategy and understand their part in making the strategy succeed, and give them metrics to measure their success. Connect departments Scorecard metrics, like your strategy, are interdependent. Show medical and administrative staff how their performance affects others. 12 12 In addition to the right software to help organizations track efficiencies, IBM also provides the thought leadership and best practices for finding the right metrics to measure. Best practice budgeting, plans, forecasts and financial reporting are also a cornerstone of better performance and efficiency. Becoming a leaner organization means swapping out inefficient processes in favor of new systems capable of driving ongoing performance. For instance, rather than setting targets at specific numbers, your decisionmakers may want to begin tying performance targets to events, trends and risk factors. Rather than engaging in planning on an annual basis, they might consider adopting shorter planning cycles focused on the achievement of specific tactics and initiatives. Rather than measuring performance in absolutes, your business operations users can use critical business ratios to gain a comprehensive overview of organizational efficiency. 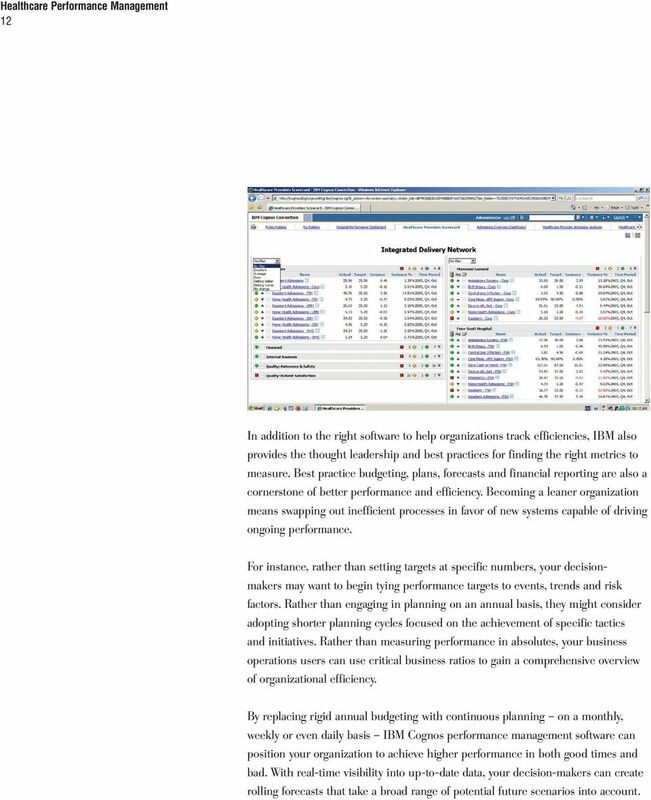 By replacing rigid annual budgeting with continuous planning on a monthly, weekly or even daily basis IBM Cognos performance management software can position your organization to achieve higher performance in both good times and bad. With real-time visibility into up-to-date data, your decision-makers can create rolling forecasts that take a broad range of potential future scenarios into account. 13 13 Using driver-based modeling and predictive analysis, financial managers can model and project changes in reimbursement rates and cash reserves while operations management and service line directors can develop action plans for variable future volumes, increasing operational agility and responsiveness to consumer demand and resource requirements. 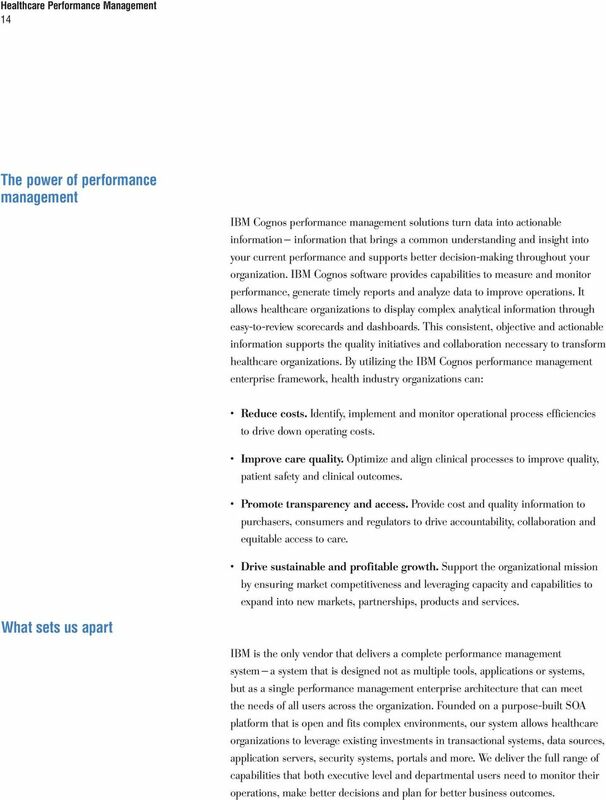 Performance management with IBM Cognos software: Enables healthcare organizations to establish corporate targets and develop integrated, functional, financial and operational plans. Allows healthcare institutions to do both top-down and bottom-up planning to ensure alignment with strategic objectives. Provides the ability to automatically cascade drivers from one department to another in order to drive volume, revenue and expenses across every department of the organization. Manages profitability planning, analysis and reporting by service lines and locations, permitting an extremely high level of precision. Provides activity-based drivers and rates used for planning and reporting, allowing unsurpassed accuracy, consistency and confidence. 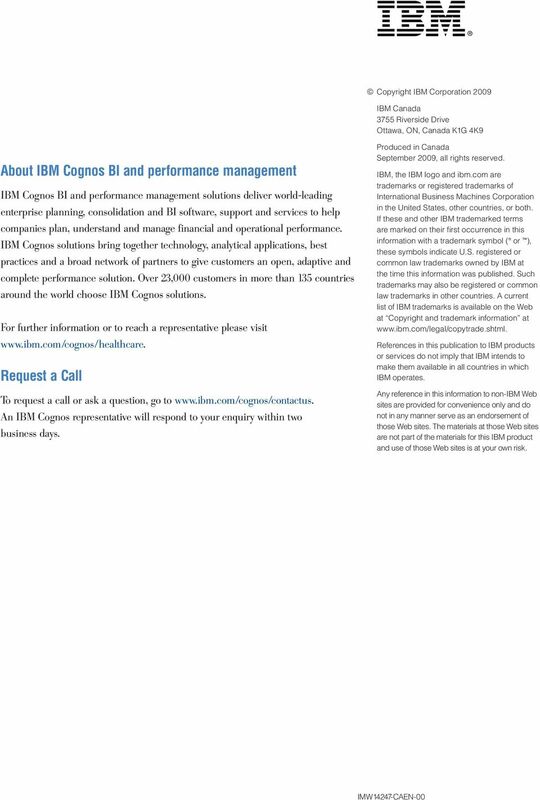 14 14 The power of performance management IBM Cognos performance management solutions turn data into actionable information information that brings a common understanding and insight into your current performance and supports better decision-making throughout your organization. IBM Cognos software provides capabilities to measure and monitor performance, generate timely reports and analyze data to improve operations. It allows healthcare organizations to display complex analytical information through easy-to-review scorecards and dashboards. This consistent, objective and actionable information supports the quality initiatives and collaboration necessary to transform healthcare organizations. 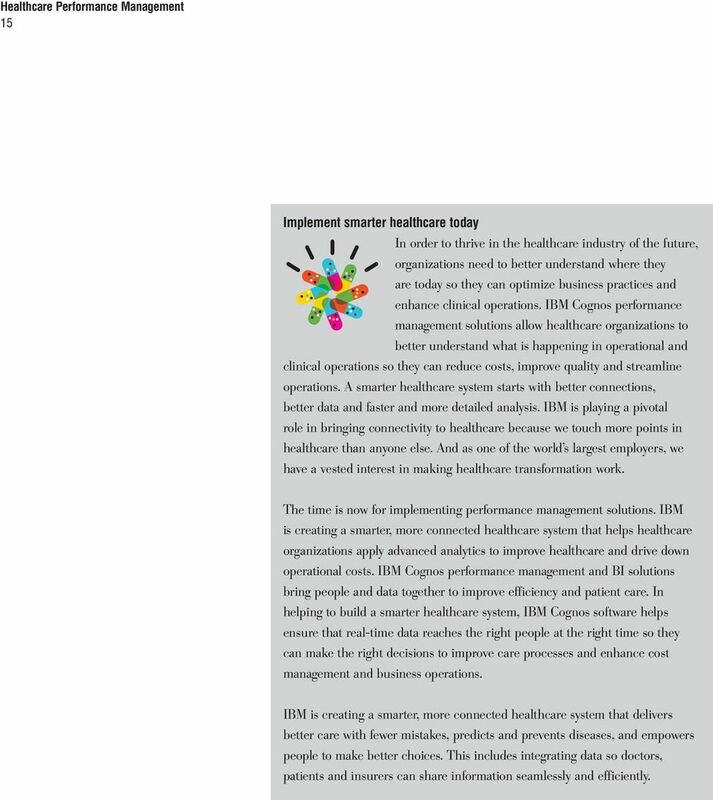 By utilizing the IBM Cognos performance management enterprise framework, health industry organizations can: Reduce costs. Identify, implement and monitor operational process efficiencies to drive down operating costs. Improve care quality. Optimize and align clinical processes to improve quality, patient safety and clinical outcomes. Promote transparency and access. Provide cost and quality information to purchasers, consumers and regulators to drive accountability, collaboration and equitable access to care. Drive sustainable and profitable growth. Support the organizational mission by ensuring market competitiveness and leveraging capacity and capabilities to expand into new markets, partnerships, products and services. What sets us apart IBM is the only vendor that delivers a complete performance management system a system that is designed not as multiple tools, applications or systems, but as a single performance management enterprise architecture that can meet the needs of all users across the organization. Founded on a purpose-built SOA platform that is open and fits complex environments, our system allows healthcare organizations to leverage existing investments in transactional systems, data sources, application servers, security systems, portals and more. We deliver the full range of capabilities that both executive level and departmental users need to monitor their operations, make better decisions and plan for better business outcomes. 15 15 Implement smarter healthcare today In order to thrive in the healthcare industry of the future, organizations need to better understand where they are today so they can optimize business practices and enhance clinical operations. IBM Cognos performance management solutions allow healthcare organizations to better understand what is happening in operational and clinical operations so they can reduce costs, improve quality and streamline operations. A smarter healthcare system starts with better connections, better data and faster and more detailed analysis. IBM is playing a pivotal role in bringing connectivity to healthcare because we touch more points in healthcare than anyone else. And as one of the world s largest employers, we have a vested interest in making healthcare transformation work. The time is now for implementing performance management solutions. IBM is creating a smarter, more connected healthcare system that helps healthcare organizations apply advanced analytics to improve healthcare and drive down operational costs. 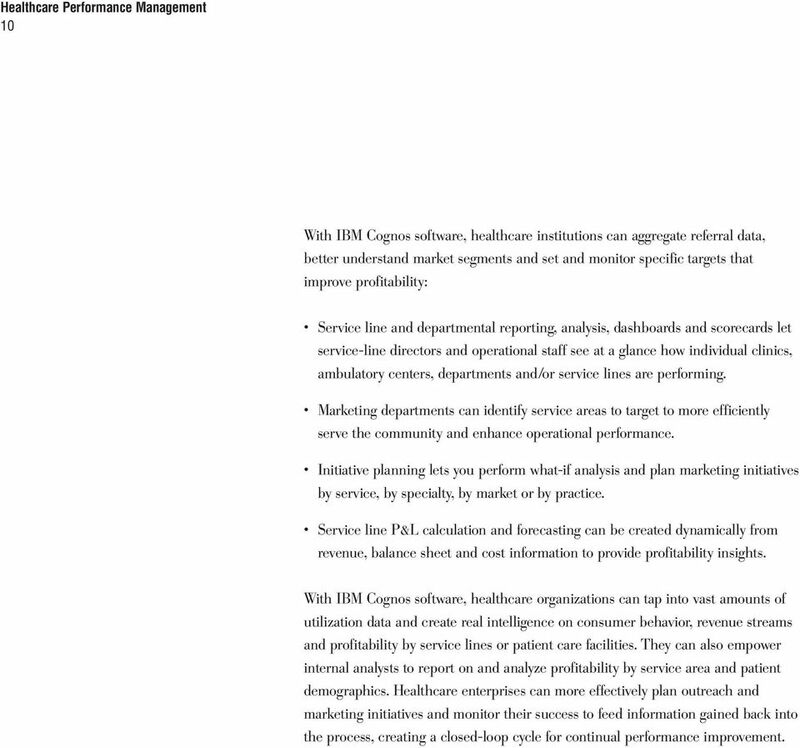 IBM Cognos performance management and BI solutions bring people and data together to improve efficiency and patient care. In helping to build a smarter healthcare system, IBM Cognos software helps ensure that real-time data reaches the right people at the right time so they can make the right decisions to improve care processes and enhance cost management and business operations. IBM is creating a smarter, more connected healthcare system that delivers better care with fewer mistakes, predicts and prevents diseases, and empowers people to make better choices. This includes integrating data so doctors, patients and insurers can share information seamlessly and efficiently. 16 16 Summary Decision-making happens at every level, in every function, in every department and service line of a healthcare organization. Every one of those decisions is based on the information people have on hand, whether that decision is financial, administrative or clinical in nature. If that information is on target and reliable, timely and easy to consume, better decisions result. Information that is inaccessible or incomplete, late or inaccurate has a direct and negative impact on decisionmaking, and ultimately, on the quality of care delivery and on the efficiency of operational performance. IBM is playing a critical role during this time in history because we touch more points in healthcare than anyone else from connecting electronic medical records throughout medical offices, hospitals and pharmacies to improving care and reducing cost to accelerating medical research with deep analytics that discover how well drugs work. IBM has 450,000 reasons to care about healthcare counting employees, dependents and retirees, IBM spent almost $1.3B on employee healthcare last year alone. 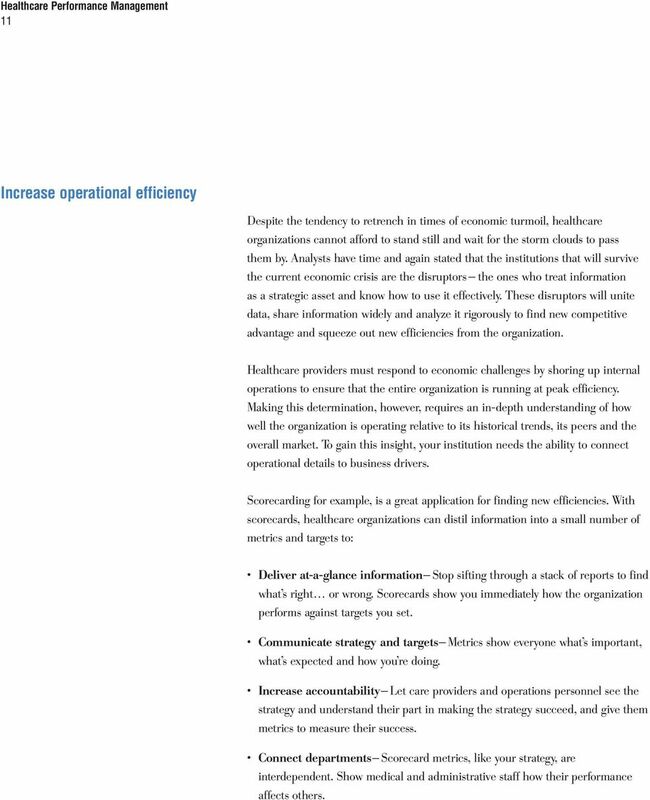 IBM Cognos software is enabling healthcare organizations to react quickly to changing environments, operate more efficiently and continue to pursue growth by helping them gain deeper insight into operations. 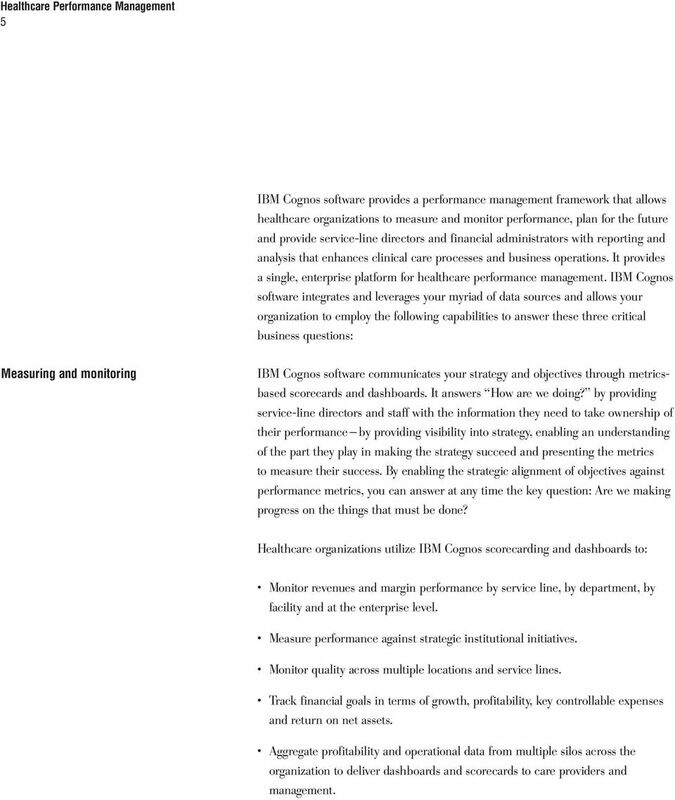 The IBM Cognos performance management system allows healthcare organizations to leverage existing investments from multiple sources, and it delivers the full range of integrated capabilities financial managers, service-line directors and operational users need to monitor performance and make better decisions. When the going gets tough, the tough need insight. That s why leading healthcare organizations turn to IBM. Case Study Wyeth Pharma: Sales success with an IBM Cognos solution Overview Challenge Turn large quantities of market and company data into solid, actionable information for Wyeth s sales team Why IBM?